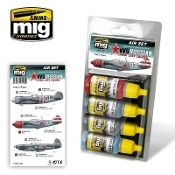 High-quality acrylic paint set includes all 4 colors used to accurately apply the camouflage for the aircraft of the Soviet Air Force during the later years of World War II. With these references, we can represent well-known airplanes including some piloted by the great Soviet aces, such as the La-5 and La-7, or the famous Yak-3. The colors are based on photographs and documents of the time representing exact colors, although slightly lightened to compensate for the scale effect. This paint is created using a formula optimized to obtain the maximum performance from both brush and airbrush application.